It’s a bit difficult to tell from the below announcement what artists are participating in this Wimbledon College of Art show. The accompanying blog post assumes almost a similar amount of insider knowledge. But it may be of interest to this readership. There is a Korea Day at the college on 4 February in the afternoon, linked to the exhibition. Details at the bottom of this post. Image: Sing Sing Karaoke Bar. Photographic collage courtesy of Richard Layzell. The second in Wimbledon’s 2016-17 series on Communities and drawing on research by artist and course leader of Wimbledon’s BA Print & Time-Based Media, Richard Layzell, Korea Town at Wimbledon Space will focus on the nearby community of North and South Koreans living in New Malden, just two train stops down the line from Wimbledon. 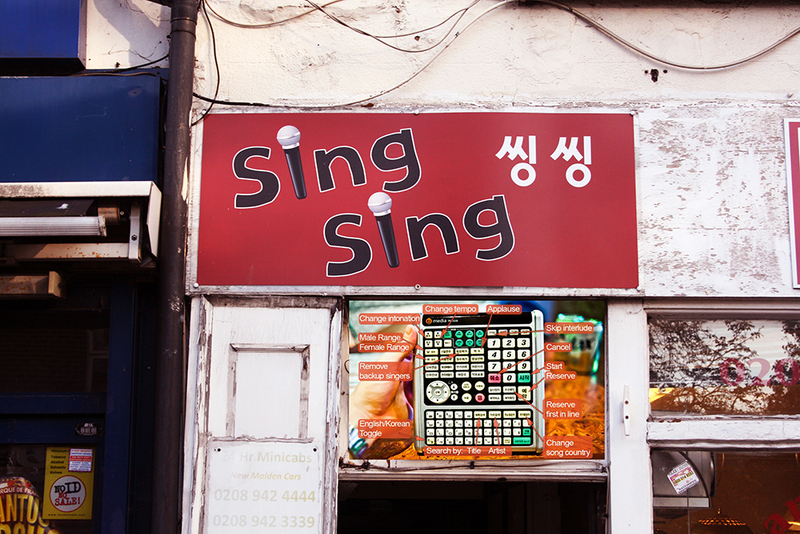 More than 10,000 of the 29,000 people living in this part of London are Korean, and Layzell’s research involves interaction with the public facing elements of these communities: shops, cafes, hairdressers and, particularly, HAN and Sing Sing Karaoke Bars. Kpop Noraebang (karaoke) in Korea is a national obsession, taking place in small rooms that are hired out by the hour. The centrepiece of the gallery, whose walls will be decorated with allusions to Korean popular culture, will be a reconstruction of one of HAN Karaoke Bar’s private rooms: a participatory, interactive structure where audience members can participate in karaoke, with an emphasis on Korean popular songs. Accompanying this will be video projections of documentary and performance works. Please join us for a unique celebration of Korean culture at Wimbledon College of Arts. This is a special kind of Open House event linked with Richard Layzell’s exhibition Korea Town – Noraebang at the Wimbledon Space Gallery, our connections with the Korean University of the Arts in Seoul and our nearby Korean community in New Malden. It is also a chance to experience the reconstruction of a Noraebang karaoke room from New Malden and a homage to Korean sijo poetry. There will be special guests, including Prof Ko Heesun from K-Arts in Seoul and artist Jina Lee, an optional Anglican Communion service (all welcome) in English and Korean, where prayers will be said for peace in the world, led by the Revd Mark Dean, Chaplain to University of the Arts London, and Revd Soon-han Choi, Chaplain to University of West London, and refreshments. Most of all this is a celebration of the uniqueness of Korean culture and our Korean friends who live and study in London. Filed in: Asides | Event Notices | Exhibition news | Koreans in UK | Koreatowns.